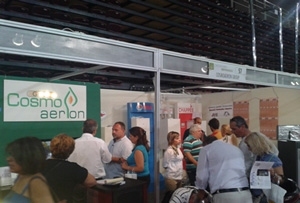 The unique AHT electric underfloor heating system was presented in a very impressive way by the Cosmoaerion Group at the ECONOMIC HEATING Exhibition held in Athens-Greece between 28-30 of September. The Cosmoaerion team led by Mr Yiannis Hadjinicolaou worked tirelessly throughout the duration of the exhibition explaining the unique advantages of our system to the thousands of Greek visitors who passed through their stand. 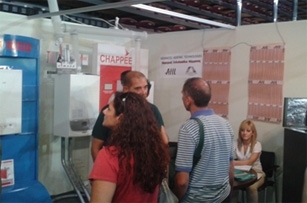 The Cosmoaerion Group is a market leader in Greece the fields of heating and renewable energy and due to the negative effects of the economic crisis in the Greek market has added the AHT heating mats to its product range as a more economic and best value for money heating option. We welcome Cosmoaerion to the growing AHT family worldwide and we are sure that they will enjoy much success. As a seasoned market analyst who visited the exhibition said “Crisis or no crisis you cannot keep AHT down. It’s just like Macdonalds and it keeps growing because it gives what the consumers of today want”.